SYRIA – What happened to the diplomatic process to stop the conflict in Syria? In an interview on the BBC programme The Andrew Marr Show, foreign secretary, William Hague, said that the UK government did not rule out the possibility of arming Syrian rebels, and denounced Syria’s president, Bashar Al-Assad as delusional. It seems that the west, and in particular the UK, are intent on arming the rebel faction, which includes significant numbers of al-Qaeda extremists, and put diplomatic solutions to one side in favour of military action. This is despite Assad stating quite clearly that his government is willing to enter into diplomatic dialogue to bring an end to the suffering being inflicted on the people of Syria. 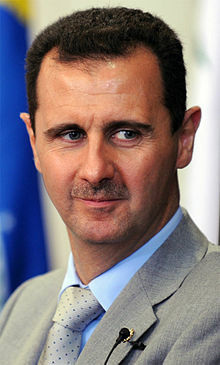 In early February, both the Syrian government and the leaders of the opposition said they would enter into talks. On February 5th, Moaz al-Khatib, president of the Syrian Opposition Coalition, urged President Bashar Assad to respond positively to the call for dialogue. “The regime must take a clear stand (on dialogue), and we say we will extend our hand for the interest of people and to help the regime leave peacefully,” he said in comments to Al Jazeera. The opposition had previously rejected any negotiations with the government, but now al-Khatib says he is ready to meet Vice President Faruq al-Sharaa. On February 7th, after the Syrian opposition sought dialogue, the Assad government said they were ready to talk and find a solution. And both sides have said they will continue to seek a diplomatic solution past deadlines the opposition set for the release of women prisoners on February 10th. But it seems that western governments are failing to take advantage of opportunities to bring the bloodshed to an end, and are pushing forward at all costs with the arming of the opposition. On February 15th, Hague warned that Syria is not the “number one” destination of jihadists, who could then return to Europe experienced “in weapons and explosives” to carry out terror attacks. If this were a true concern, why would Hague advocate providing military assistance and arms to jihadists already fighting in the country, it just makes no sense at all and is contradictory. Far from bringing the Syrian conflict to an end, the provision of military support and armaments will put resources in the hand of people who will use them for terrorist purposes, if the government are to be believed. The fact that both sides in the conflict are willing to engage in a diplomatic solution should be the main focus of the international community, and their resources should be spent on that rather than pursuing more military action which can only result in more pain and suffering inflicted by both sides for the ordinary people. It seems that western governments have a vested interest in maintaining instability in Syria until they can install a puppet government, a tactic we have seen many times before, especially in the Middle-East. From recent events, it seems that these governments don’t give a damn about the people who live in these countries and are only intent on achieving their own power and control agenda. An interesting article; thank you for sharing it.